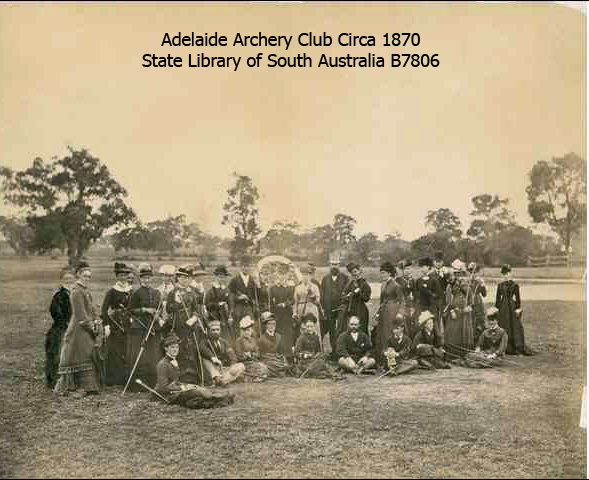 The Adelaide Archery Club probably began with the arrival of Colonel William Light to South Australia in 1836. This worthy gentleman, who planned Adelaide and most of the close suburbs, brought with him two longbows and many sets of arrows. Quite obviously he was an enthusiastic archer and would have influenced others. There is, however, no record of the activity of the Adelaide Archers until about 1850 when the club was quite active. The archives carry a number of references to the Club in those early days including the original plans of Adelaide setting aside a portion of the land for an area for archery. Archery had its ups and downs and war in particular brought about a break in the sequence of club activities. In 1939 Captain Colin Duncan gathered together interested parties to bring back formal archery to Adelaide, and in August, 1940 the first meet of the Archery Club of South Australia was held. This club went into recess in 1942 during WWII. Captain Duncan, (later Major) is remembered annually at the club with a clout tournament held in his honour. In 1944 Alex Barter with a small group from the northern region and Bill Bowden from a munitions factory, got together to shoot at Deer Park under the name of the Adelaide Archery Club. The Archery Club of South Australia reformed after the War and the two clubs held regular competition until, in August 1946, the two clubs united and held their first shoot as a combined club under the name of the Archery Society of South Australia. Today the Archery Society of South Australia (ARCHERY SA) is the State body of all archery clubs in South Australia who are affiliated with Archery Australia, and the original club's name reverted to Adelaide Archery Club. The Adelaide Archery Club has been noteworthy for producing champions of Australian, Olympics and World Championships team members and for always being at the forefront in Archery Australia and ARCHERY SA administration. The club has been responsible for founding or assisting to establish a large number of metropolitan and country clubs; it is a club that holds together with the common aims of enjoying and furthering the sport of Archery.